DOHA, Qatar (AP) — Artur Dalaloyan ended the men's team final at the world gymnastics championships in tears — and not the good kind. A mistake on parallel bars by the 22-year-old played a factor in Russia's narrow runner-up finish to China. 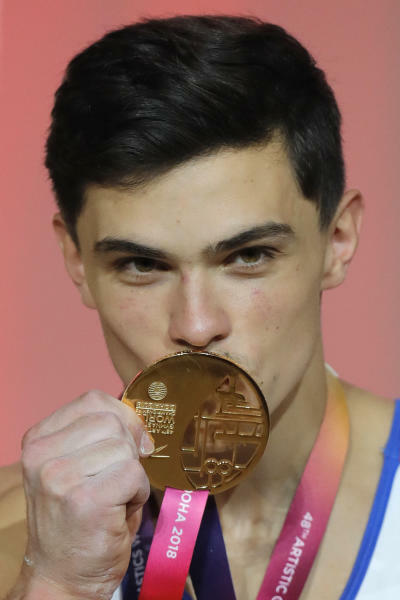 Though Dalaloyan skipped training in the run-up to Wednesday's all-around final in an attempt to decompress, his mind kept drifting back to the five-hundredths of a point that proved the difference between gold and silver for the Russians. "It was scrolling through my mind," Dalaloyan said. It proved to be the fuel he needed to keep the opportunity to stand atop the podium from slipping through his grasp twice. Dalaloyan drilled his high bar set, watched 2017 world champion Xiao Ruoteng of China do the same and then fought back tears — the good kind this time — after becoming the first Russian to win a world or Olympic all-around title in nearly 20 years. Though Dalaloyan and Xiao both finished with a score of 87.598, Dalaloyan was awarded the gold on a tiebreaker after the officials dropped the lowest score for each competitor. "I do feel a little pity about that," Xiao said. "But respect to the judge and respect to the rival." Xiao went last in the 24-man final and the 14.233 he needed to get to pull even with Dalaloyan was plastered in bright yellow letters on the video board inside the Aspire Dome. When his score flashed — 14.233 — there was a brief moment of confusion before the tiebreaker was announced. Xiao didn't exactly hang his head in disappointment. "I want to be No. 1, yeah but this result, I'm still happy," Xiao said. 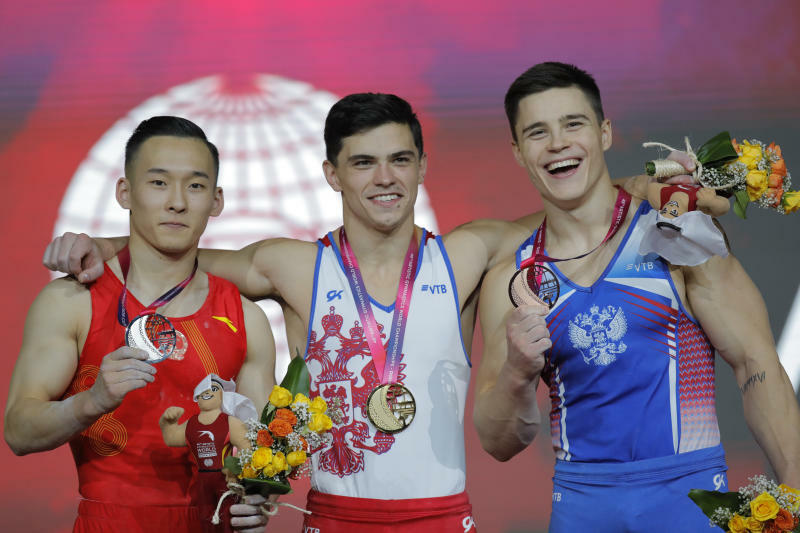 The victory marked a redemption of sorts for Dalaloyan, who came off the parallel bars shortly after his mount during the team final, the deduction one of a handful of miscues by the Russians that helped China return to the top of the sport for the first time since 2014. There were few miscues for Dalaloyan two days later. He put up the top score on rings and was second on vault, floor and parallel bars and third on high bar while becoming the second Russian to win the world all-around title, joining Nikolai Kryukov in 1999. Alexei Neimov captured gold for Russia at the 2000 Olympics. "It's amazing," Dalaloyan said in English after joining exclusive company. Dalaloyan's teammate Nikita Nagornyy took third. China's Sun Wei was fourth. American Sam Mikulak was in medal contention heading into the final rotation, but the five-time national champion lost his grip with one arm during his high bar routine, a mistake that dropped him to fifth. Teammate Yul Moldauer came in 12th while dealing with a biceps injury and back issues. There were no such problems coming in for Mikulak, which only added to his frustration. "I've never been so (mad) in my life," he said. And for good reason. Mikulak dazzles with his talent but has developed a habit of coming up just short when on the world stage. Five years ago, he was second going into high bar in the 2013 all-around final but had a similar problem to the one that popped up Wednesday night. "I was feeling so good," Mikulak said. "Felt all the confidence in the world. There were no nerves. No doubt. I'd practiced that exact scenario a million times back in the gym." Practice, however, did not make perfect. His mistake wasn't disastrous, but on a day when the top gymnasts in the world left little room for error — a marked improvement over a sloppy team final — Mikulak couldn't quite summons the crispness he needed. "You've always got to fight until the end," Mikulak said. "But man that just hurt. That hurt real bad." Mikulak will have a chance to pick up the first world championship medal of his otherwise outstanding career later in the meet. He's in four event finals. Yet he has poured himself into chasing an all-around medal for the better part of a decade. At 26, he's well aware that his opportunities are dwindling. "I'm going to keep kicking," Mikulak said. "It's not over. The (Olympic) Games are always where the goals are, but I was really hoping this was my chance." It was until it wasn't.